I came across this question on multiple forums and it is being solved using multiple function such as DATENAME and LEFT function functions. However, lets solve it using FORMAT function only. Let me create an example to explain it. 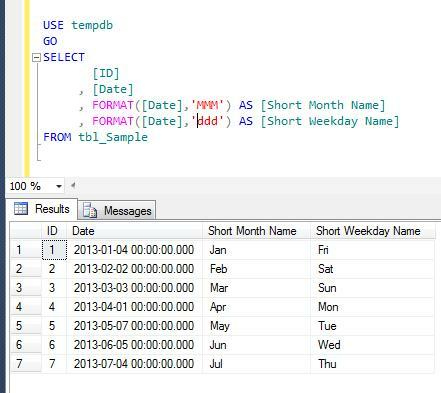 In this method, we will use DATENAME & LEFT function to achieve short name of month and weekday. 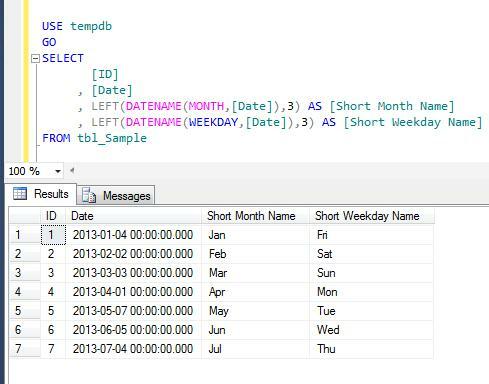 In this method, we will use ONLY FORMAT function (shipped in SQL Server 2012) to achieve short name of month and weekday. SQL SERVER 2012 – Fix – Error :11508 – The undeclared parameter is used more than once in the batch being analyzed. In my earlier article, I wrote about one of the new system stored procedure sp_describe_undeclared_parameters shipped with SQL Server 2012. This is very handy system stored procedure whenever you need to find undeclared parameters in a SQL query. I was trying to find undeclared parameters in a query using this system stored procedure and came across with a new error message. I did some research and fixed it. Error Message: The undeclared parameter ‘%. *ls’ is used more than once in the batch being analyzed. 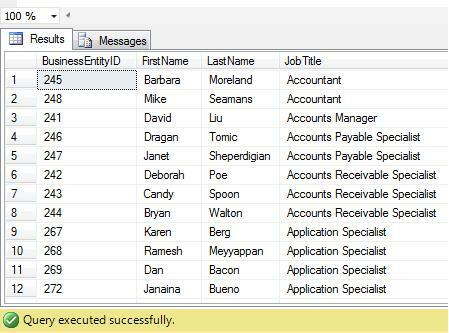 In the given below example, I need to search country region name and a portion of a name in First name, Middle Name & Last Name columns of the employee view. So I wrote a query and it works perfectly. Given below is the script. Once the query is executed successfully, lets pass the above query to sp_describe_undeclared_parameters to find undeclared parameters. The undeclared parameter ‘@Search_Name’ is used more than once in the batch being analyzed. If you look at the ERROR, you will easily realize that @Search_Name is used as a parameter in the query multiple times. But if you remove @Search_Name from the query, the purpose of the query would be dead. So what is the remedy? It is very simple to fix, just pass @Search_Name parameter in the sp_describe_undeclared_parameters as an input parameter, and the error message will be gone. Lets do it. 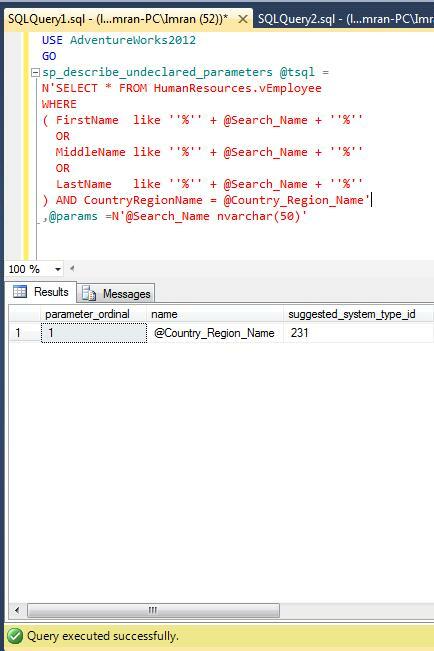 Remember, whenever you come across this error message just search for that particular parameter name causing error in the query and pass it into the sp_describe_undeclared_parameters as an input parameter. 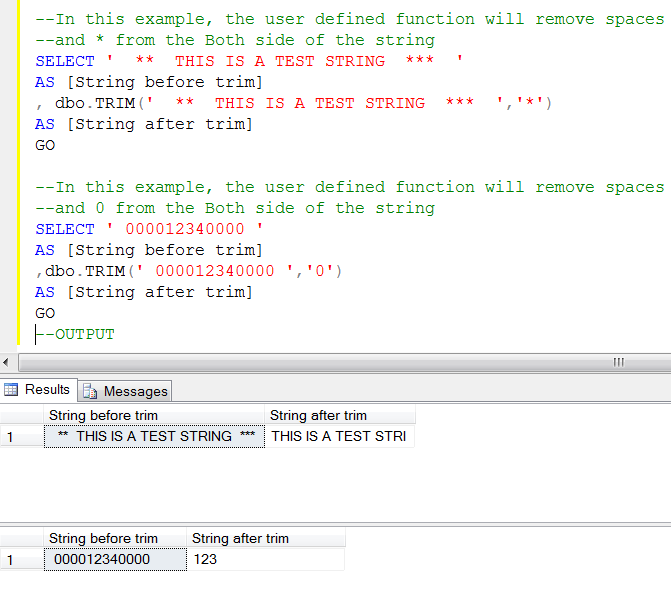 There is a possibility that multiple parameters can be placed in the query in multiple times. So to fix this error just pass all the parameters mentioned in the error message and run sp_describe_undeclared_parameters again. 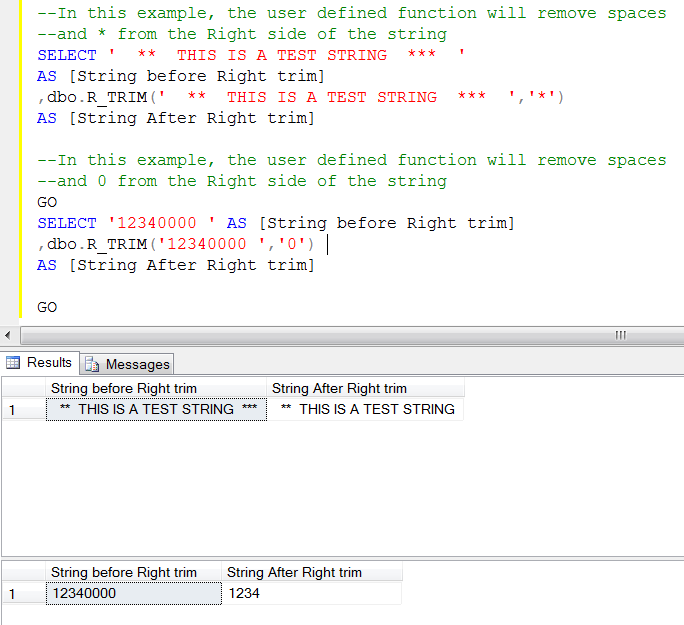 LTRIM and RTRIM are very useful functions when it comes to trim the left side or right side of the string spaces respectively but if you need to trim spaces from both sides , you need to create a user defined function. 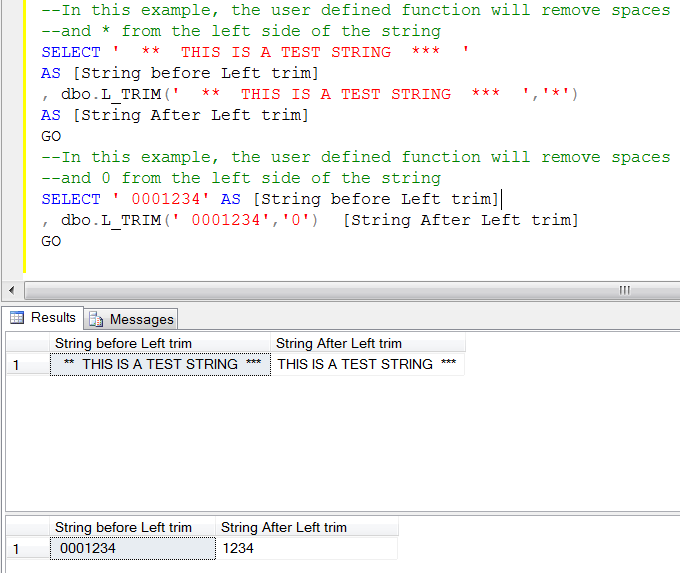 Here is the script of user defined function. I have been using these built-in and user defined functions for a long time. But a few days ago, when I was migrating the data from legacy system to our new system, I came across with an issue i.e., I had to trim not only the spaces but also the characters as well. Given below is the solution that can help you to trim(remove) the spaces and characters from the LEFT side of the string. Given below is the solution that can help you to trim(remove) the spaces and characters from the RIGHT side of the string. Given below is the solution that can help you to trim(remove) the spaces and characters from the BOTH sides of the string. A few days ago, I wrote an article about Multiple ways to convert month number to month name. 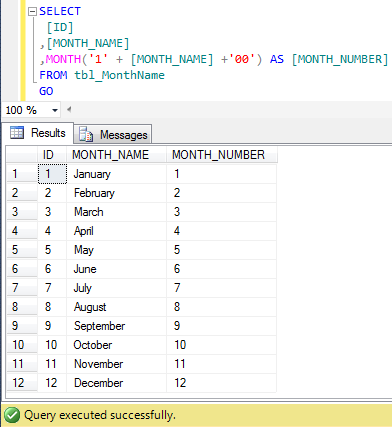 Recently, I received a query inquiring how to convert Month name to Month number. Let me create a sample to demonstrate this solution. In this method, we will use the Old approach. 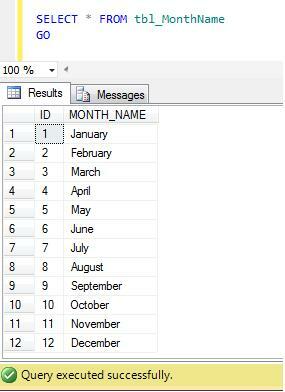 In this approach, we need to manually concatenate day with month name and year to make a complete date of that particular month using additional single quotes and then get the Month number from this concatenate date using MONTH function. Given below is the script. In this method, we will use the New approach. 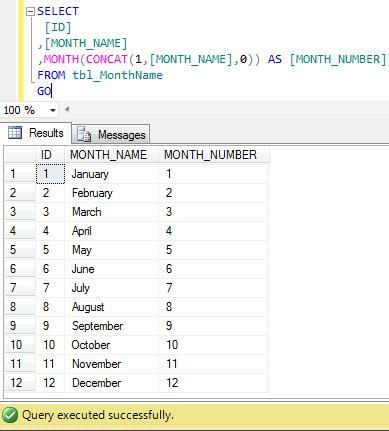 In this approach, we need to automatically concatenate day with month name and year to make a complete date of that particular month using CONCAT function (without any single quotes) and then get the Month number from this concatenate date using MONTH function. Given below is the script. ‘Dynamically order by’ clause of any query result set is an old topic and has been discussed on multiple forums. Mostly the solution is being achieved using CASE statement. But what encourages me to write this article is that we can achieve the same with shorter code using IIF & CHOOSE logical functions shipped with SQL Server 2012. In this method we will use the traditional approach and dynamically order by the query result set using CASE statement. Given below is the script. 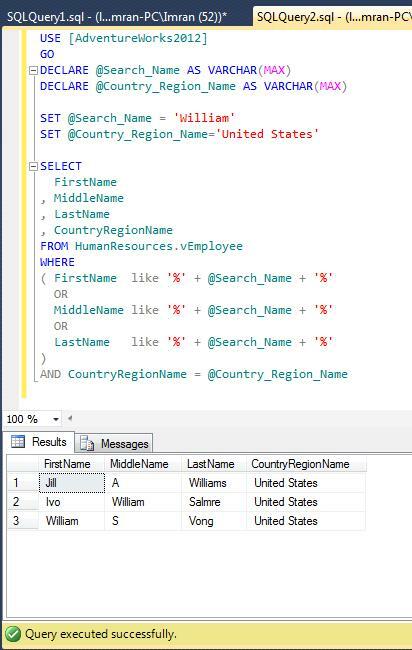 In this method we will use a NEW approach and dynamically order by the query result set using IIF logical function shipped in SQL Server 2012. Given below is the script. In this method we will use yet another NEW approach and dynamically order by the query result set using CHOOSE logical function shipped in SQL Server 2012. Given below is the script. In all of the above methods we used different methods, functions, approaches but the output will remain same and also it will not impact performance. It just reduces the line of code. SQL SERVER – Fix – Error :1969 – Default FILESTREAM filegroup is not available in database. I came across this Default FILESTREAM filegroup is not available in database ‘%. *ls’ error today, while I was working on a table using filestream. This error message is part of SQL Server since 2005 version. Error Message: Default FILESTREAM filegroup is not available in database ‘%.*ls’. Let me create a database and table to demonstrate this error message. Default FILESTREAM filegroup is not available in database ‘Musicdb’. Ooopps…… I am unable to create the table. Lets fix it. If you look at the error, it says that there is no default filestream in the filegroup but there is a possibility that even filestream is not available in the filegroup. Lets now resolve this issue step by step. In this step, lets check in the Musicdb database if filestream is available in the filegroup or NOT. In step 1, you can see that not a single filestream is available in the filegroup. So first lets create a filestream in filegroup. Given below is the script. Note : if filestream is already available in the filegroup then do not proceed with Step 2 . Go to Step 3 directly. In step 1 if filestream is available in filegroup then without going to step 2, just execute the given below script and it will make your filestream as a default filestream in the filegorup. Lets create the table again. Remember, whenever you come across this error, you just need to either create a filestream in a filegroup or make the existing filestream as a default in filegroup.